No-Bake Cool Whip Cheesecakes are not only super easy to make but also totally adorable! No one will know that you didn't spend hours baking these little cheesecakes. They use only six ingredients if you don't make your own crust. They're rich and fluffy all at the same time...the perfect decadent, yet cool summer dessert. We topped them with fresh summer berries, but you can top them with whatever fruit you like. Make them ahead of time, to cut down on prep the day you are serving. Place the graham crackers and sugar in a food processor and process until completely crumbled. Drizzle in the melted butter. Press the graham cracker crust into 6 greased mini cheesecake molds. If you are using a muffin tin, make sure to use liners. Bake for 5 to 10 minutes at 350 F or until lightly browned. Beat the softened cream cheese with the sugar and vanilla extract until combined and fluffy. Fold the whipped cream topping into the cream cheese mixture. Fill the prepared molds with the cream cheese filling. Fill the molds a little bit at a time. Then press down on the top of the filling with a spoon or spatula so they completely fill the mold and there are no gaps or pockets of air. Cover and refrigerate for 2 hours, or until completely chilled and firm. 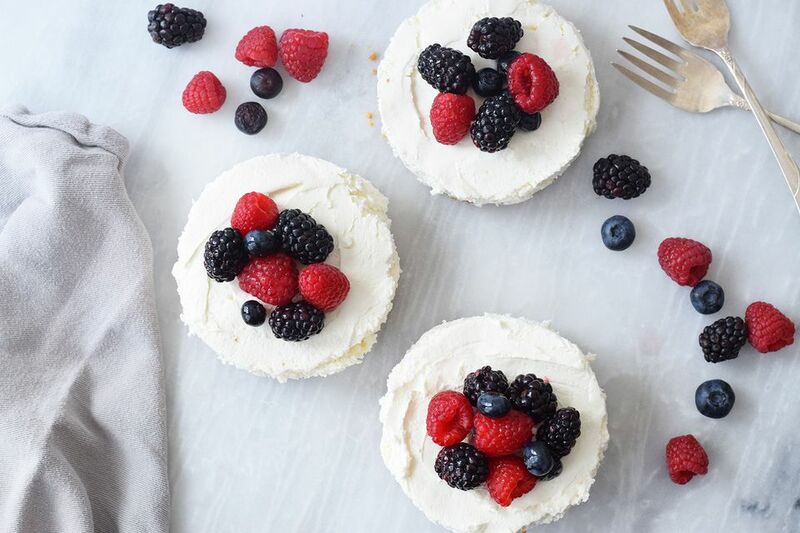 Remove the cheesecakes from the molds, top with fresh berries and serve! They can also be kept chilled for up to 2 days before serving! To make this into one large cheesecake, use a springform pan or prepare it in a pie plate. You can also buy a pre-made store-bought graham cracker pie crust. This will save you time and dishes. To make these cheesecakes in a cupcake tin, put cupcake liners in each of the molds and form the crusts in them. Feel free to top these mini cakes with whatever fruit you want, like strawberries, pineapple, or cherries. You can also use your own homemade whipped cream instead of the prepared stuff. Make sure your cream cheese is very soft before you start whipping. This will ensure that the cheesecake doesn't have any lumps and stays smooth and creamy. Don't overmix the cream cheese mixture. If it's beaten too much it will lose some of its fluff.